Philadelphia Flyers defenceman Radko Gudas picked up a two-minute minor penalty on Thursday night for interference after colliding with New Jersey Devils forward Kyle Palmieri. Gudas left his feet before the hit and Palmieri said after the game he believes Gudas deserved a suspension. "After certain events and a certain history, you lose the benefit of the doubt of saying it was an accident," Palmieri told NJ.com. "His history speaks for itself. I know it's a fast game, stuff happens out there, but like I said, you lose the benefit of the doubt after a couple incidents and reckless plays. "It's not my decision to make, but it seems more than likely that he's run out of second chances." With the interference call, Gudas picked up his first penalty since returning from a 10-game suspension in November for slashing Mathieu Perreault of the Winnipeg Jets. TSN Director of Scouting Craig Button argued Thursday that despite his history, Gudas does not deserve further discipline for the incident. Button believes Gudas was attempting to avoid contact when the two collided. "He really looks like he got caught in no-man's land. He's turning up ice, Palmieri's coming in behind Wayne Simmonds, [Gudas] jumps off his feet, he launches at him, but I don't think this was intent," Button said. "While people will look at Radko Gudas and say, 'Oh boy, he's got this history, he's coming off a 10-game suspension,' I don't think this warrants a 10-game suspension. I don't think it warrants any type of suspension." 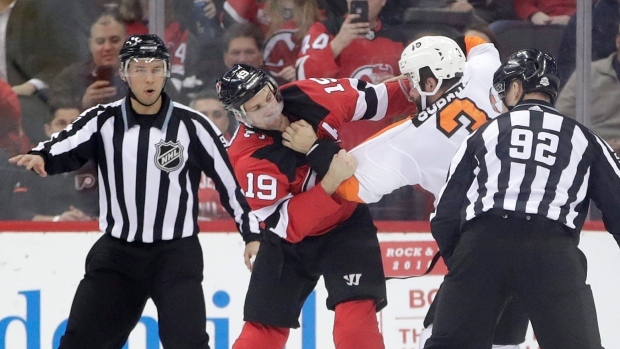 Gudas picked up a five-minute major fighting Travis Zajac later in the first period.